Discussion in 'Hardware Components and Aftermarket Upgrades' started by TakedaYabu, Feb 6, 2019. 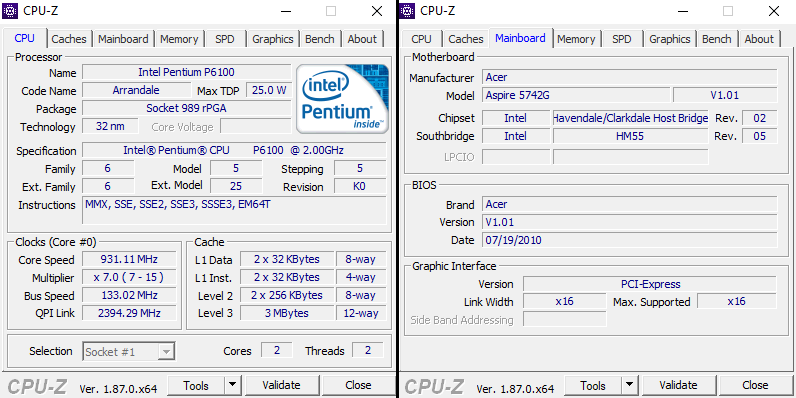 I have a fully working Acer Aspire 5742ZG (p614g32mnkk), and after changing from 4GB to 8GB RAM (DDR3 1066MHz) and from an HDD to an SSD, I now wish to upgrade my CPU from a P6100 to a i7 640M. According to the Chipset (Mobile Intel HM55 Express Chipset) and according to the Socket G1, this i7 640M is the best CPU I can upgrade to, right? Is the CPU in my laptop upgradable (not soldered)? Is the i7 640M fully compatible? I believe the rPGA means it's NOT soldered, therefore it's upgradable, right? If yes, will the i7 640M be fully compatible without any issues (despite having Turbo mode)? Yes, and it should work perfectly. If the i7 is a bit expensive, even the i5-540m is a massive upgrade and it wont lose much at all when compared to the i7, the i's are all dual core with hyper threading cpu's, only the clock increases from model to model. TakedaYabu and Starlight5 like this. What about the BIOS, do I need to upgrade it or do something to receive the new CPU? And you could grab the i5 for 5-10$. Just use a decent thermal paste, clean the heatsink/fan and put it back together. Its the same series, so its just put CPU, and start the PC, you might want to go to Device Manager, CPU and uninstall, then reboot, so that the turbo works correctly. Thank you again for your swift reply! So, the P6100 (original - 2 cores & 2 threads, no turbo) and the i7 640M (the one I want - 2 cores & 4 threads, with turbo) are from the same series and therefore all I have to do is replace them? Which happens to be the same TDP as the i7-640M (also 35.0W according to the website). Could you confirm this situation please? I dont know where CPU-Z gets the TDP info/value, but its wrong. Thank you so much for your support man, you have cleared all my main concerns! But having that i7 CPU (despite also being a Dual-Core) with 4 threads instead of 2 and also with Turbo, won't run the risk of overheating or consuming too much energy from the Power Supply?? The Arrendale CPU family was launched in 2010, there are no new CPU's being made for a long long time, so all you can find is used chips, and thats fine, CPU's dont degrade, they either work like new or they wont work at all, I would grab a used i5 from ebay for 10-15€, max the RAM to 8GB and mount a cheapo 250GB SSD, both the RAM and a cheap SSD will do much more than the extra 200/300MHz that you gain between an i5 and the top i7. Since the TDP is the same, it will heat the same, and if the laptop was never repasted, expect it to run cooler than stock. Also, remember to use h.264ify extension in your browser so youtube plays mp4 videos that your iGPU can decode instead of VP9 that will hammer your CPU.